On Friday, April 1, the Annex on Filbert brimmed with new works of art from local and visiting artists at the second annual Philadelphia Art Book Fair. 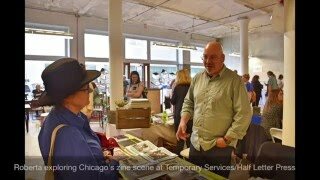 Presented by the Philadelphia Photo Arts Center and the Print Center, the two-day fair featured quirky zines, niche periodicals, and sumptuous art and photography books for purchase. By early evening, First Friday was in full swing in Old City. Paintings, prints, and sculptural work at Indy Hall, Pii Gallery, and Rodger LaPelle delighted and inspired gallery-goers. Outside, there were a few street performers despite the torrential cloudburst earlier that day. Check out Artblog’s coverage of the Art Book Fair and First Friday below. Keep up with artistic goings-on in Philadelphia by signing up for Artblog’s newsletters and by following Philly Artblog on Facebook, where upcoming events are announced.